Discussion in 'Accessories, Cables, and Remotes' started by Martin Dew, May 22, 2018. AMPED America has announced the availability of the AMP2400, the company's latest 2-Channel 400 Watt per-channel Class D power amplifier (made in the USA). The AMP2400 is now making its debut into the high-end and luxury audio markets, and features Audiophile Ultra Sonic Performance (AUSP) technology, while also delivering 'unmatched' performance with Fully Protected High Efficiency Power Supply and Auto Selectable Mains (EPS). 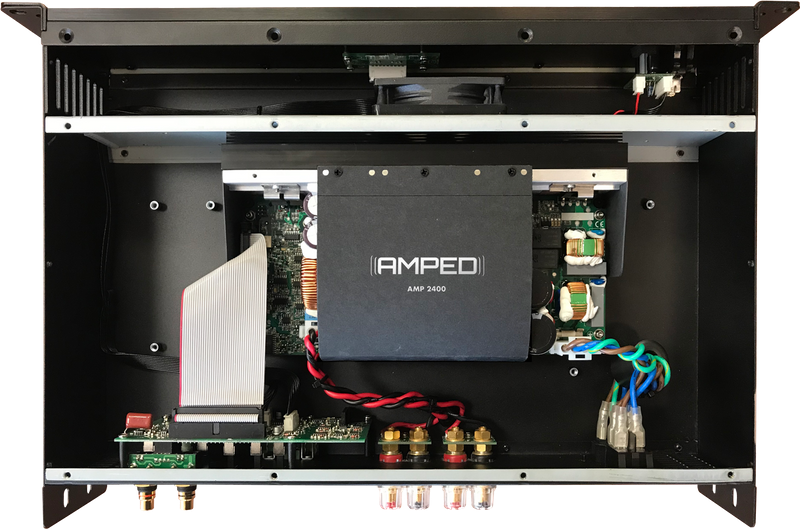 AMPED is a small New Jersey-based company, with 'vision to design', which develops and manufactures 'Best-in-Class' High Performance Audio Amplifiers made in USA. The power rating from the Class D stage boasts 400W per channel into 8 ohms and 800W per channel into 4 ohms, while frequency response is measured at 5Hz - 70kHz, according to the www.ampedamerica.com website. Audio inputs include 2 L/R balanced XLR connectors and 2 L/R gold-plated RCA unbalanced connectors, while audio outputs comprise 4 gold-plated speaker binding posts. The company states that the chief applications for the AMP2400 are home theater, 'surround sound', high performance 2-channel audio and mutli-room and zone amplification. The unit has a 2U rack height and the front panel is finished in black anodized aluminum. There is currently no information provided concerning pricing, and the 'Authorized Dealers' page on the website promises 'Coming Soon'. It's always good to hear that small audio firms are still designing, engineering and manufacturing in the US, so companies like this will always elicit the support of HTF. If any of our members here have more information about AMPED America, please let us know in the comments below because, other than the company's thin website, there's precious little info when performing online searches. Interesting. Class D seems to be coming of age. I was amazed to see PS Audio is even making them. I get the feeling this isn't really a "high-end and luxury market" model, though. The finish and electronics strike me more as a home-afied variation on a standard PA amp.